Tourism has become a major industry in New Zealand as international travellers are attracted both by the country’s natural features and increasingly its distinctive cultural creativity. One place which combines both aspects is Whakarewarewa in Rotorua. Alongside a spectacular area of geothermal phenomena, visitors can watch Māori carvers at work, under the auspices of the New Zealand Māori Arts and Crafts Institute. 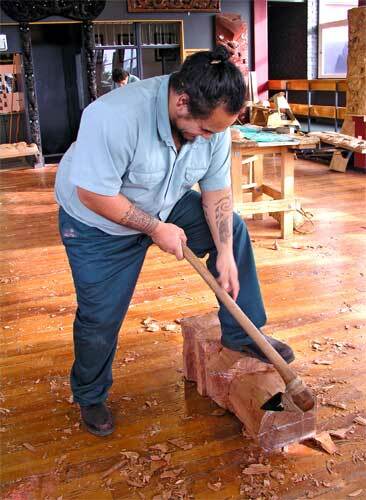 Here Arekatera Maihi, of the Ngāti Whātua and Ngāpuhi tribes, begins work.